Trainer Peter Moody says the Gr1 Australian Guineas (1600m) at Flemington on 5 March is the likely target for talented colt Gold Symphony. The son of Blue Diamond winner Reward For Effort, who established himself as one Victoria’s most promising 3YOs last winter when scoring successive Gr3 victories in the Vain Stakes (1100m) and McNeil Stakes (1200m) at Caulfield, will open his autumn campaign in Saturday’s $250,000 Inglis Dash (1100m) at Flemington. The Inglis Dash will be Gold Symphony’s first start since a virus forced him to miss the entire spring carnival, including an intended run in the Gr1 Golden Rose in September. 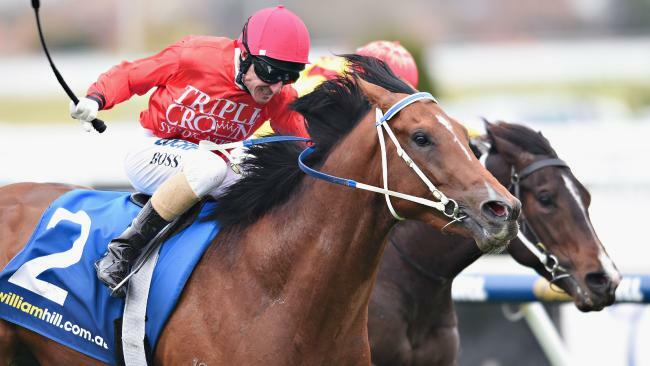 “We were going to go to the 1400 metres of the Golden Rose but he got sick,” Moody said. Moody said Saturday’s race is a suitable first-up target that will set his charge up nicely for the autumn. “This is a nice suitable race with good prize money for a return and then he can have three or four weeks to get ready for the stakes races in the autumn,” he said. Gold Symphony, who hails from the same female line as Golden Slipper winner Belle Du Jour, is raced by Triple Crown Syndications who purchased him for $100,000 at the 2014 Inglis Premier Yearling Sale from the draft of Grange Thoroughbreds.